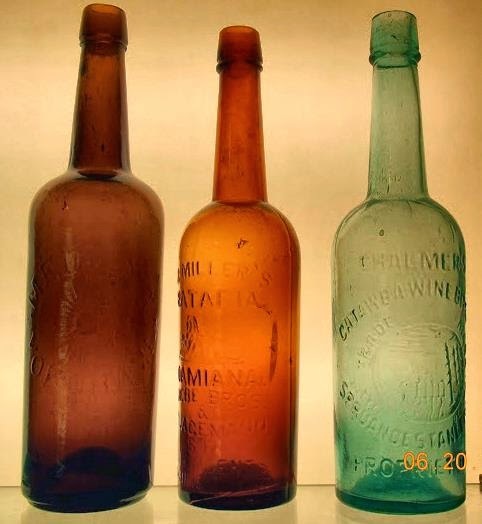 Left to right : Chinese or Japanese quart size cylinder dug by Don Dwyer in Oroville California in 1970, a Dr. Millers Ratafia and a Chalmers Catawba Wine Bitters. 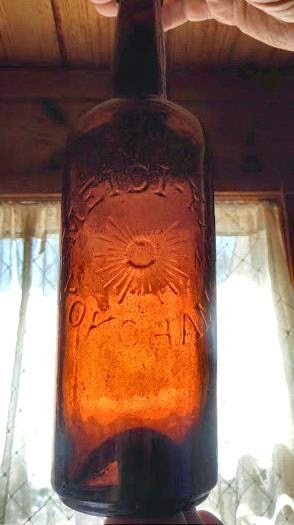 Anyone have any information on this unusual bottle with a sunburst motif ? I'd seen this one before, years ago, in a collection in Shady Cove, Or., and was curious. I researched it then, so back tracking was easy. Meidi-Ya Co., Ltd. (株式会社 明治屋 Kabushiki Kaisha Meiji-ya?) is a Japanese upmarket grocery store chain. Its headquarters are in Chuo-ku, Tokyo It is also a major wholesale distributor. Meidi-Ya was established in 1885 by Isono Hakaru (磯野 計) Meidi-Ya has 14 locations in Greater Tokyo, 7 stores in other parts of Japan, one store in Amsterdam, and one store in Singapore. As of 1989 the chain is one of the principal purveyors of the Japanese royal family. The English name Meidi-ya is the Nihon-shiki romanization of the Japanese name. Many foreigners in Japan have pronounced the name with a hard "d" instead of a "j". The di romanization is characteristic of Nihon-shiki. The Japan Brewery Company, Limited, the forerunner of Kirin Brewery, was established in 1885, taking over the assets of the Spring Valley Brewery, first founded in Yokohama in 1869 by Norwegian-American brewer, William Copeland. In a deal brokered by Thomas Blake Glover, the Japan Brewery was incorporated in Hong Kong in the name of W.H. Talbot and E.H. Abbott with financial backing provided by a group of Japanese investors including Iwasaki Yanosuke, President of Mitsubishi. The Japan Brewery first began marketing Kirin Beer in 1888. The Kirin Brewery Company was established as a separate legal entity in February 1907, purchasing the assets of the assets of the Japan Brewery and expanding the business in an era of growing consumer demand. Kirin Brewery built on the traditions of the Japan Brewery retaining the use of malted grains and hops imported from Germany and employing German brewers to oversee production. An exclusive partnership with Meidi-ya proved highly successful in the marketing of Kirin's beers both in Japan and overseas. That's what I like about this site. Someone out there has usually seen or dug a bottle I am not familiar with. Thanks for information Bruce, as I dug in China Town in Oroville. Always meant something special as the second bottle I had dug, starting out with "bottledigging George" & Chuck Lenhoff (owner of Cherokee Museum). American Bottle Auction 60 is now Open!